Sheila and her family had a summer house in Santa Cruz, California. 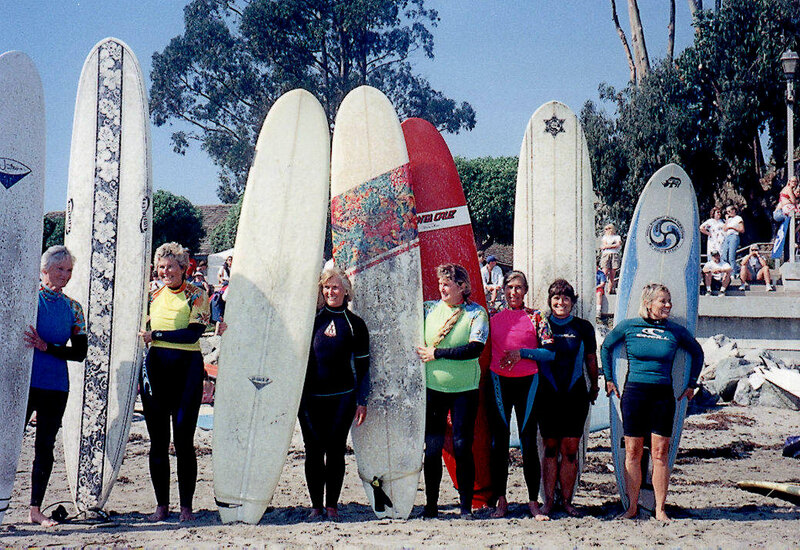 She and her sister Sharon Anater Hansen (Hansen Surfboards) started surfing in 1956, after watching a young women Charlene Mohaus Prall, come down the beach with a big paddle board out at the river mouth, they looked at each other and said, "We can do that!" Today Shelia and her husband surf Pleasure Point together and enjoy 'feeling' the ocean. Rosemari was born and raised in Hermosa Beach, California. She started surfing in 1954, at the age of 14, and learned to surf with the help of her first love and husband today, Johnny Rice. Johnny also shaped and designed her first surfboard, a blue balsa with "Rosemari" written in yellow across the nose. Rosemari surfs every day and feels strong in the sense that she says at her age, surfing keeps her physically and mentally fit and spiritually together. Rosemari lives near 'The Lane' in Santa Cruz's west side with her husband. Together they run Johnny Rice Custom Surfboards, and have seven children and seven grandchildren. To read more about Rosemari on The Shapers Tree, click here. For more pics of Rosemari in action, click here. Betty was born and raised in Cupertino, California and first saw surfing from in Sunset Magazine in 1939 in an advertisment for Mattson Cruise Line. At that moment she knew someday she would be surfing one day. Later she met a long time friend Alonzo Weimers at San Jose State University, where she expressed an interest in surfing, and he showed her the way. Her first board was made by Ted Pearson and shaped by Dale Velzy. She later traveled to Hawaii to surf with her husband, Gene Van Dyke. There she ordered her first balsa board from a Navy man, Carter Pyle, which was shaped on an aircraft carrier in the Allusion Islands. Betty has three sons, three grandchildren and has now resides at Pleasure Point.